Visit House of Blade's profile on Pinterest. House of Blades has been in business for over 40 years. B.C. Adams started selling knives which sprang from his love of collecting. He began by selling his products to various shops in the multi-state area surrounding Texas. Eventually, the inventory was too large to be mobile, and he built a brick and mortar store in 1982. By 2000, the store had outgrown its 2500 square foot building, so the larger 5000 square foot log cabin was built to house the now gigantic inventory. Provide a customer service second to none and treat you as if you were our own family. Provide an increasingly large selection of pocket knives, fixed blade knives and kitchen cutlery items to fit the needs of every customer. Maintain this site and keep it as quick and easy to maneuver as possible. Fulfill your orders and respond to messages quickly and without delay. Your orders are shipped out the day it is ordered and get to you in 2 to 4 business days. If you are looking for brands such as Kershaw, Zero tolerance, Benchmade, Wustof, Buck, American Hunter, Anza, Bark River, Benchmade, and more; House of Blades has them. Just visit our showroom located at 6451 NW Loop 820 in Fort Worth, Texas 76135 or by calling us at 817.237.7721. 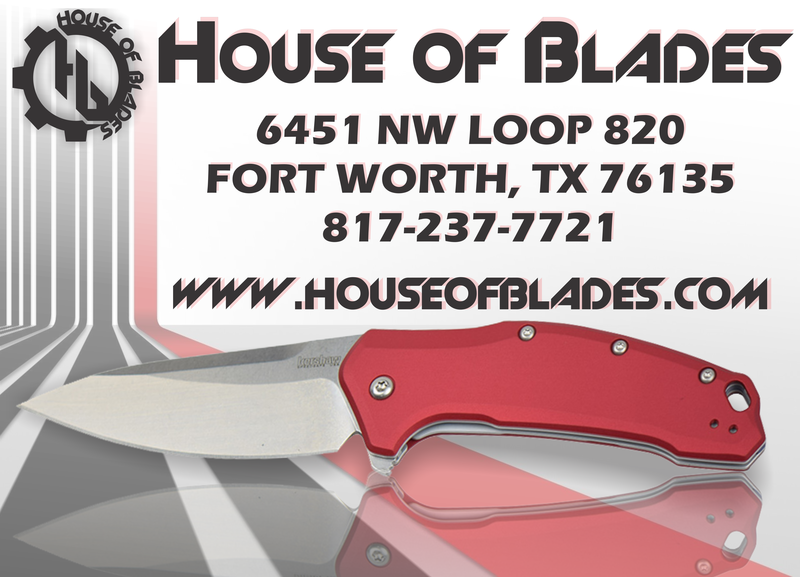 We thank you for making House of Blades the top source of knives of all kinds in the DFW area and welcome you to the House of Blades family!